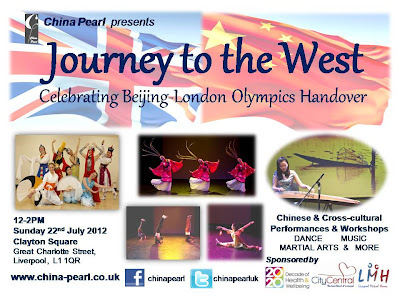 'Journey to the West' Beijing to London Olympics Handover celebration was good success. 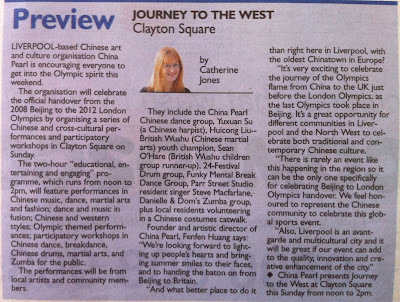 We would like to thank all the kind and generous support we got from Central Bid, Liverpool PCT, Liverpool Mutual Homes, Chung Wah Supermarket, Clas Ohlson, all the artists, staff and volunteers involved, and also everyone who attended. 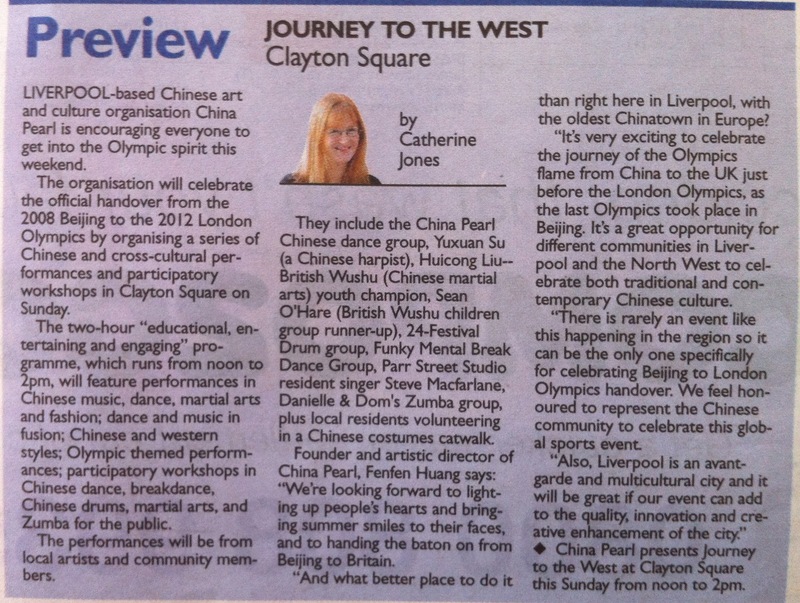 Before the event, we had very good media coverage for the event and featured on Echo, Bay TV, BBC Radio Merseyside and Radio City. 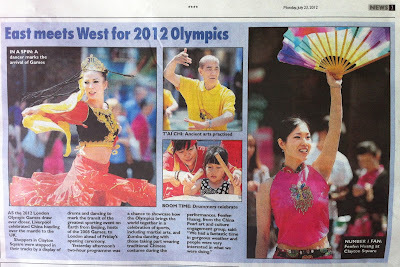 On the day of the event Sunday 22nd July 2012, the sun was smiling throughout the day in Liverpool. 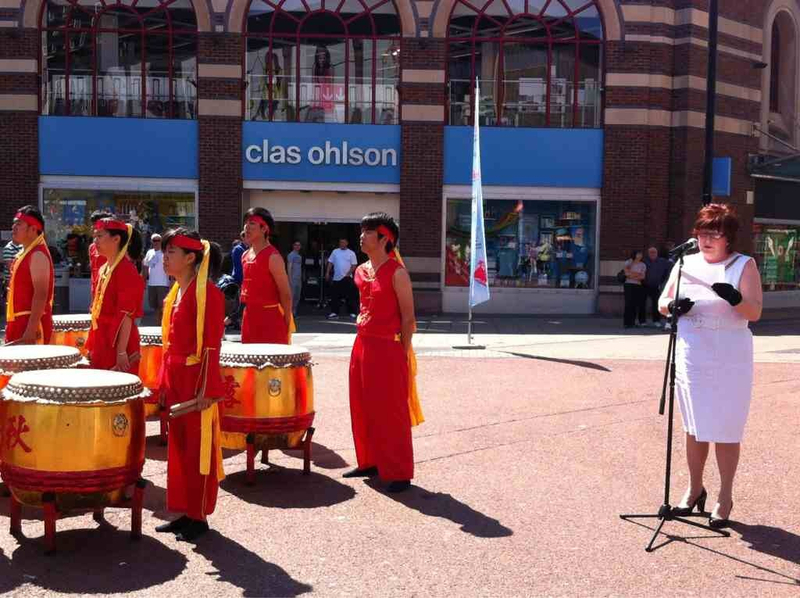 At Clayton Square at noon, we started the event on time with powerful Chinese drum performance. 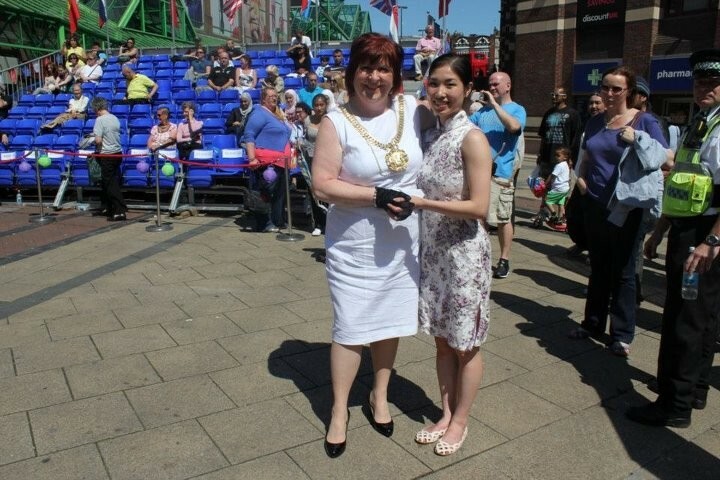 Then Lord Mayor of Liverpool opened the event for us. The 2-hour full programme went on as we planned smoothly and tightly. It was entertaining, engaging, educational and eclectic. 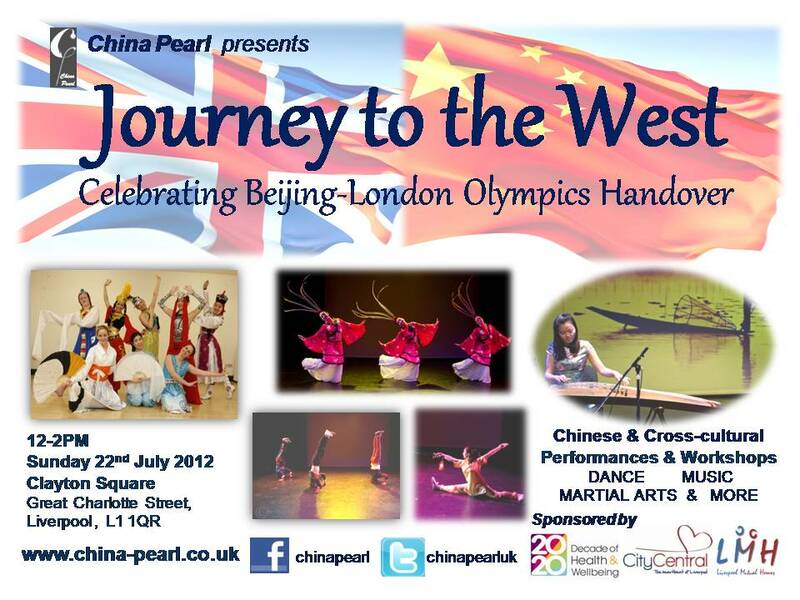 We had performances in Chinese dance, music, martial arts, Break dance, Zumba and Chinese traditional costume catwalk show and participatory workshops in Chinese dance, drums, Taichi, Wushu, break dance and Zumba. 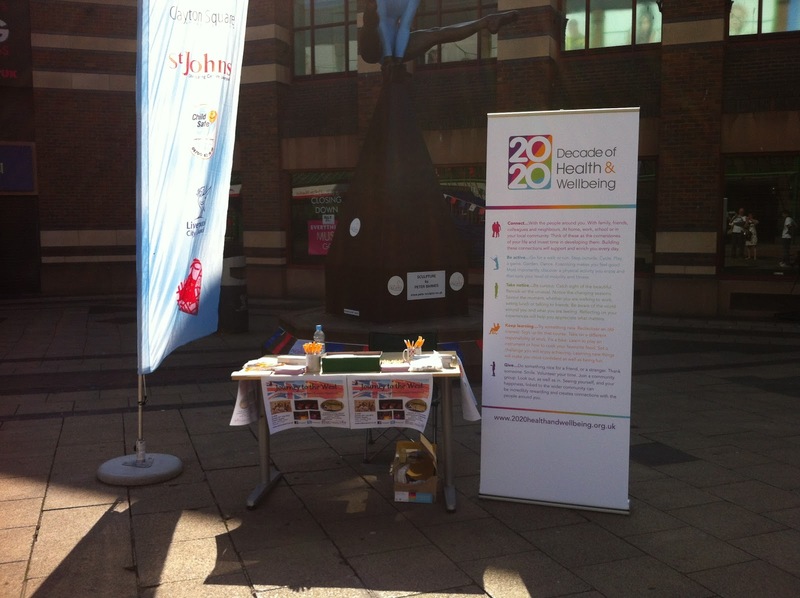 People were very interested in what we were doing and local businesses were pleased that we brought colourful and exciting activities to the area. 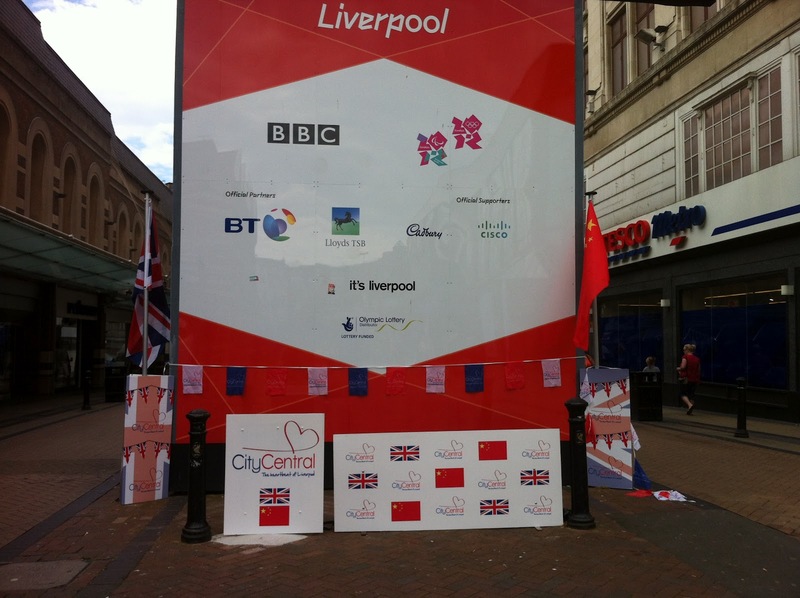 People came to attend the event from different parts of North West including Liverpool, Manchester and Cheshire; we also had a lot of new audience among the shoppers on the day who stopped with their shopping bags. In total we had roughly 2000 people watching the performances within the two hours with some of them stayed all the way through; we had around 100 people taking part in the workshops. Amazingly the 12-year-old young Lord Mayor of Liverpool Conner was so enthusiastic that he took part in all the workshops. We had very positive feedback from the participants and audience saying how much they enjoyed the event. After the event, we had a coverage on Liverpool Echo and also Fenfen did an interview with BBC Radio Great Manchester and FACT.